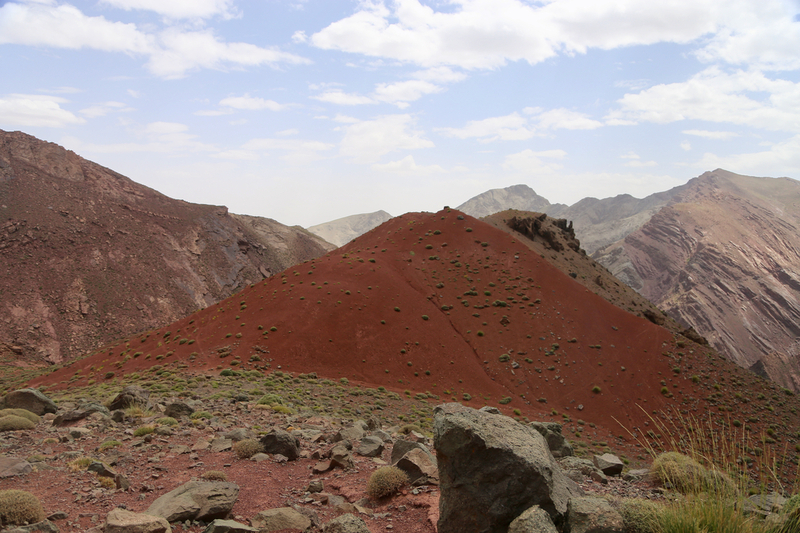 A point of reference is the well known city of Marrakech. 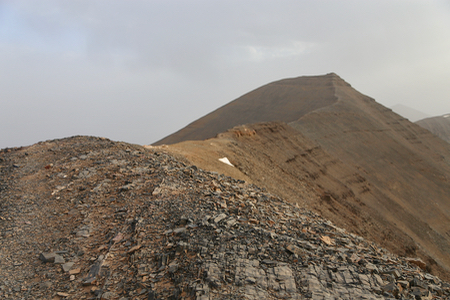 The peak can be climbed from the north (short access) or from the south (long access). 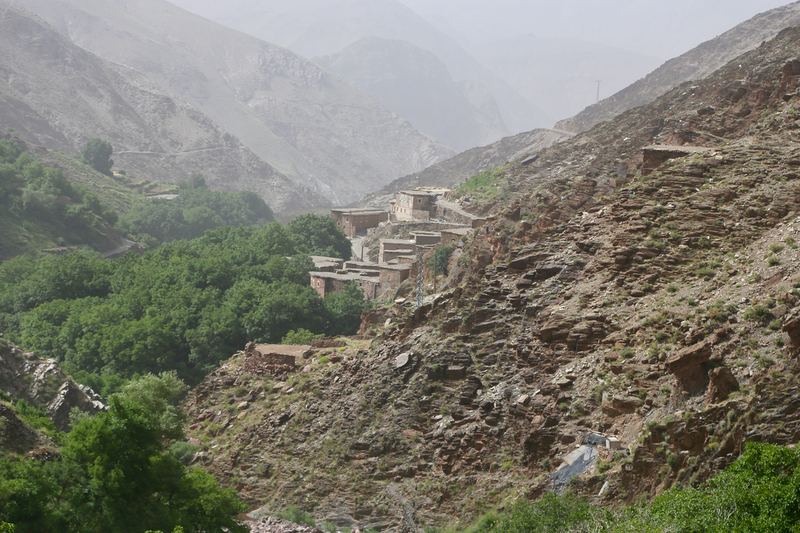 Several commercial trekking companies offer 4-5 day treks that also climb M'Goun. 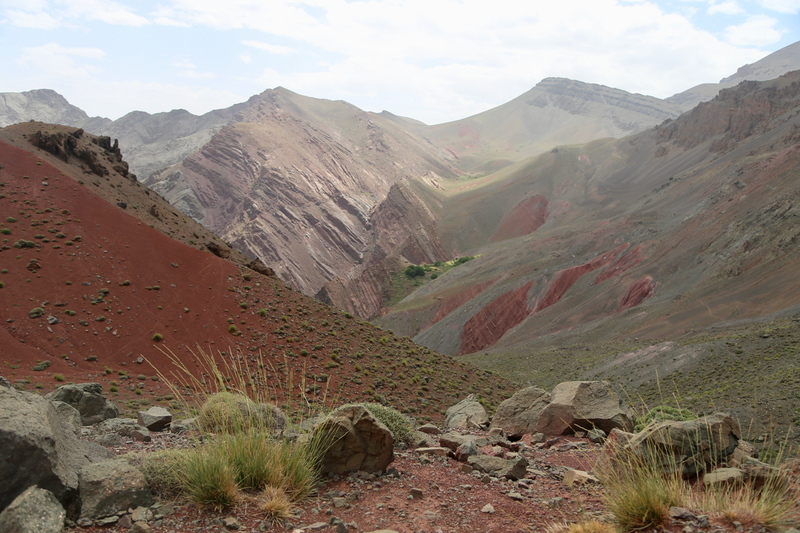 However, this climb may be done as a single (long) day climb for experienced climbers. In this case, the south access is probabely the best. 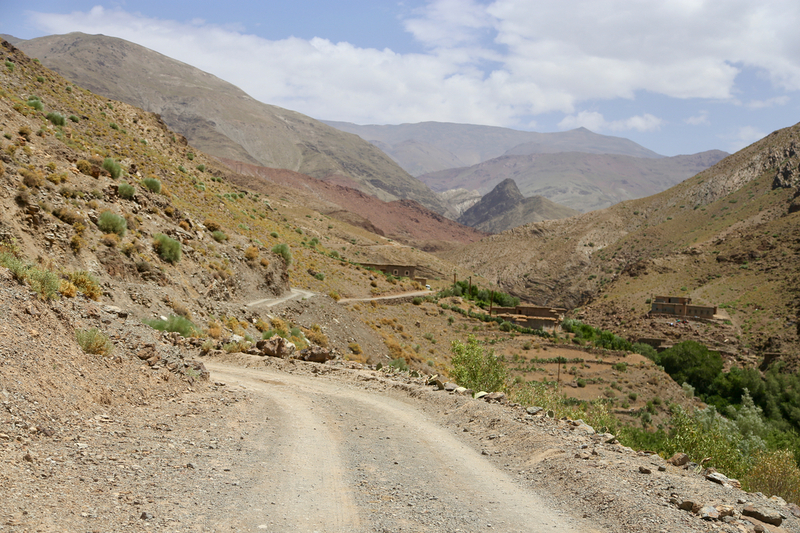 Continue along the narrow road, hopefully without meeting any other vehicles, you will get to the village of Assaka. Do not cross the river, but rather keep left and enter a smaller river-bed where people drive. A bit of care and you exit with a sharp right turn and enter a narrow street going through the village. The road continues along this impressive valley, often high up above the river, perhaps the driver should have some experience with narrow, unprotected roads. Turn sharp corners with care, staying as close to the inner part of the road as possible. 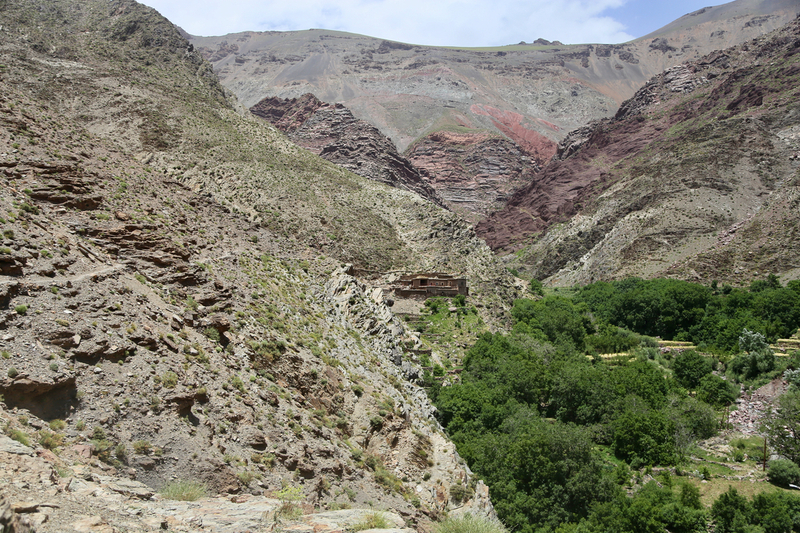 There is an impressive narrow gorge, you drive downhill and the valley narrows to essentially give room only for the river and the road. 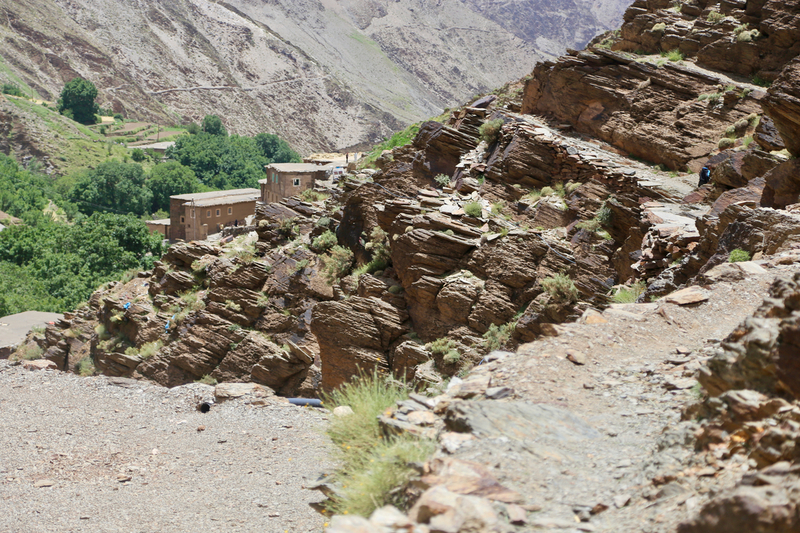 Finally, the road climbs to the very last village in the valley, there is space to park a vehicle (and to turn it around!) in the shade of some big trees. 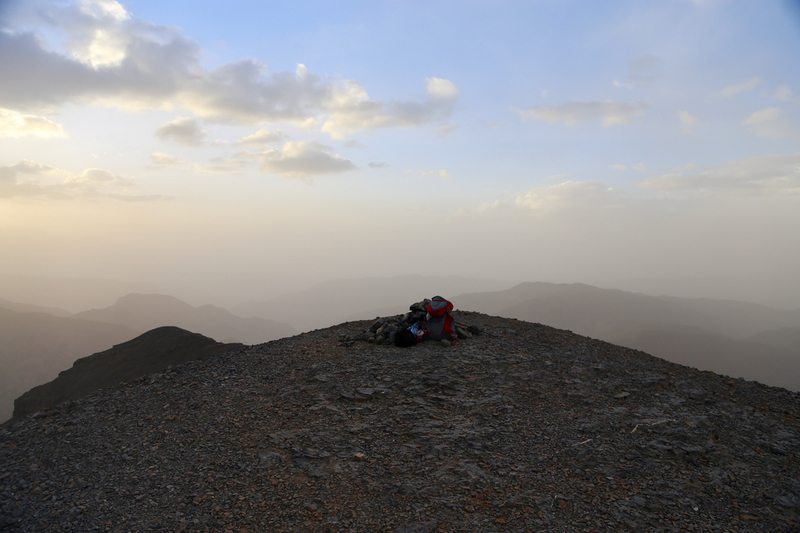 Ask a local about parking and consider paying a few Dirhams for the help and safe guarding of your vehicle while away hiking. This location is at N31.44922 , W006.48837, elevation 2300 meter. Exit the village at its upper end, do take the (left) upper trail. 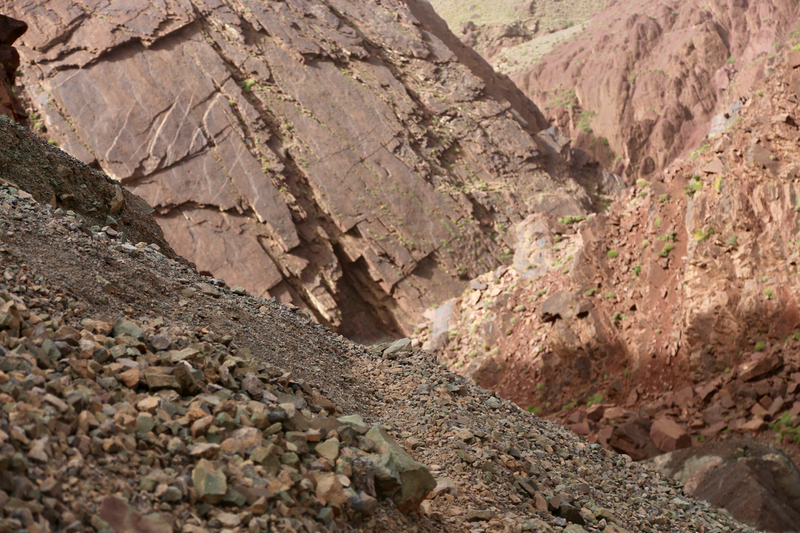 This trail crosses a few minor streams, then heads directly into the main, narrow gorge ahead. You want to follow the right branch. There is a faint path, not always easy to follow. Past the first main bend, there is a rather steepish section with loose material, care is needed. Reach location N31.46353 , W006.49054, elevation about 2600 meter, on top of this stretch (the crux of the entire route). 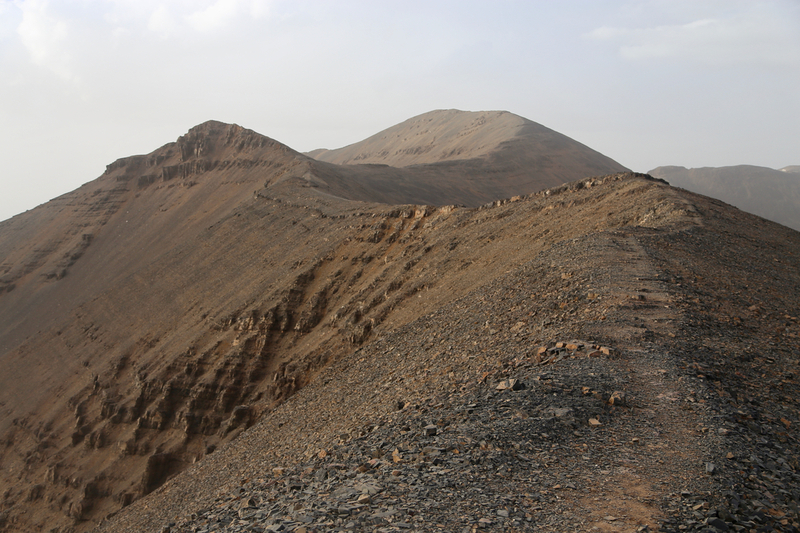 There are several smaller trails crossing the terrain in the next section of the route, but they do not serve as a route to the mountain. Ascend the terrain, going eastward, picking a good route up smaller drainages in the direction of a pretty bulky mountain (ahead). 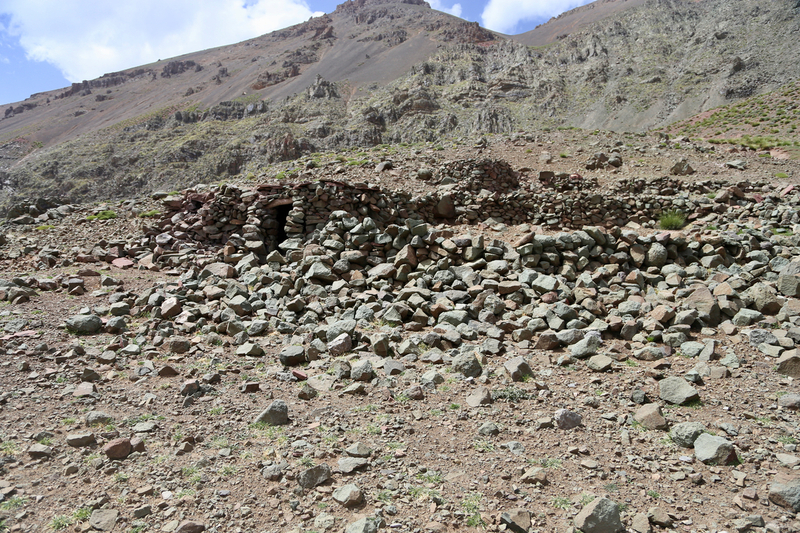 You should pass nearby location N31.46725 , W006.48199, elevaion about 2875 meter, there is a stone shelter/hut here. Cross a few small drainages, following small trails generally avoiding significant loss of elevation. 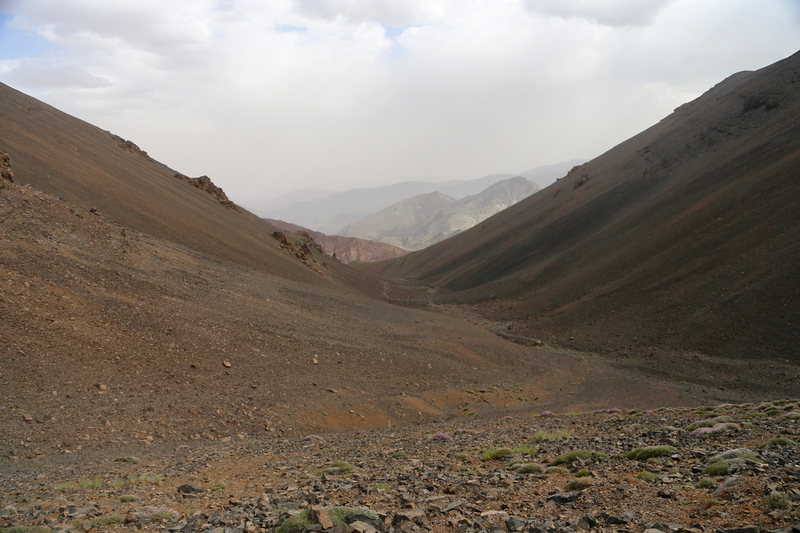 There is a distinct valley going left (north) just in front of the bulky hill, this is key to the rest of the ascent. Now, just hike up this valley, then take the right fork higher up. There are trails that may be followed. Continue up this higher re-entrant, a bit steeper as you climb higher in order to reach the main crest near, but west of a local top, point 4008. There is a major trail coming along this main ridge. What remains is now a very pleasant 2 kilometer ridge walk to the summit. 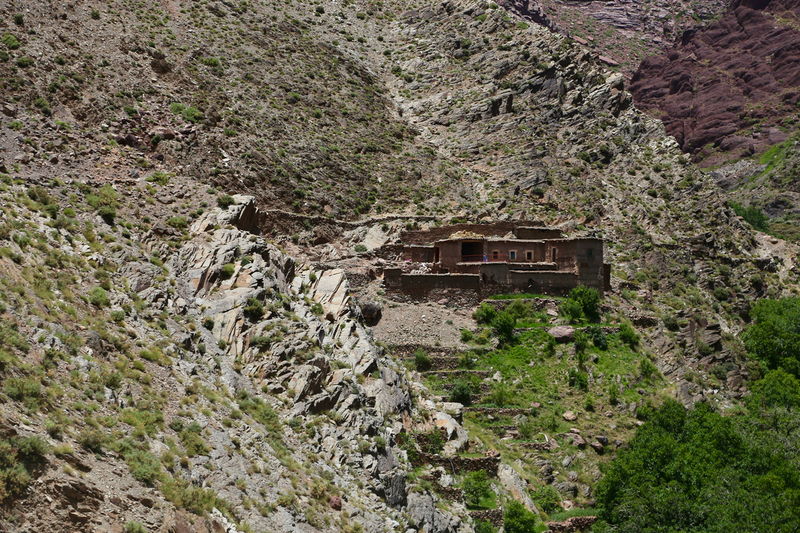 Being based in Marrakech, this is a fairly long excursion, in fact you do need 2 days. I had breakfast with my wife Heidi around 0600 and left shortly before 0630. 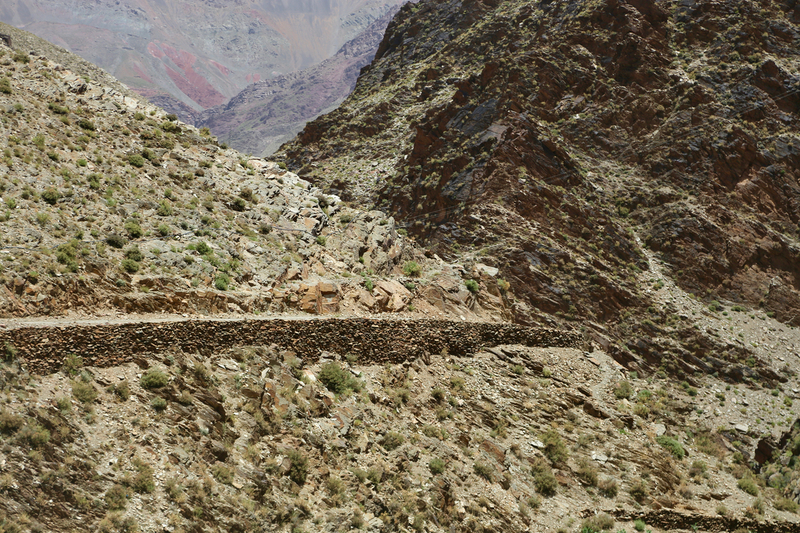 There was little traffic, but the road across to Quarzazate is long and the drive takes several hours. I passed Col du Tichka, 2260m, and noted that there must be a lower pass, since this would give M'Goun a prominence of only 1811 meter. 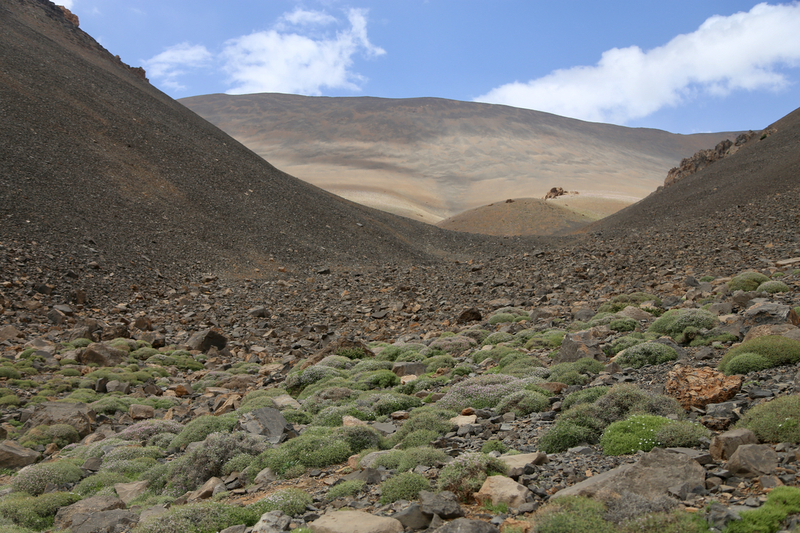 Once in Quarzazate, there were few signs to Skoura, but I made good progress and reached the small town of Toundoute at the southern base of the Atlas in about 4 hours. 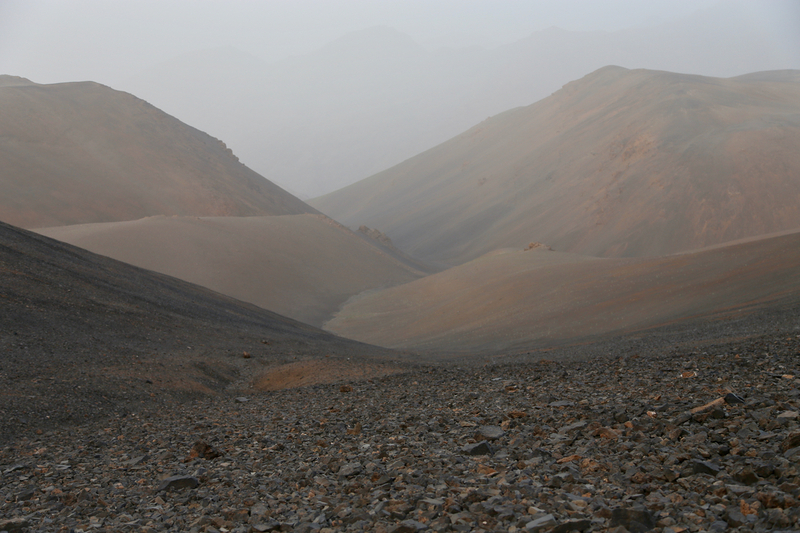 From here, the drive became more interesting, small, local roads and careful route-finding. The guy with the gite had painted several signs, but as I got to his house and noticed, but ignored the (self made) stop sign, a few people out in front acted a bit angry, some shouting voices as well as hitting my car with their hands as I slowly, but steady drove past and left them behind. 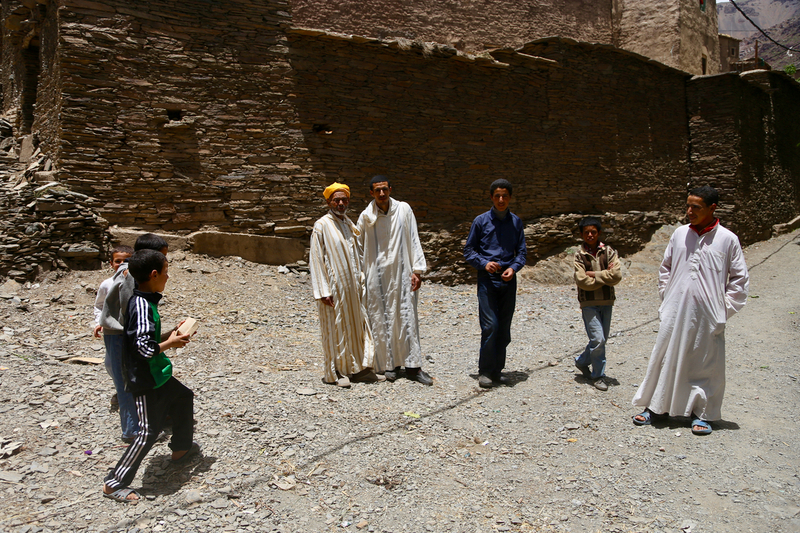 The only not so friendly behavior observed during 2 weeks in Morocco. 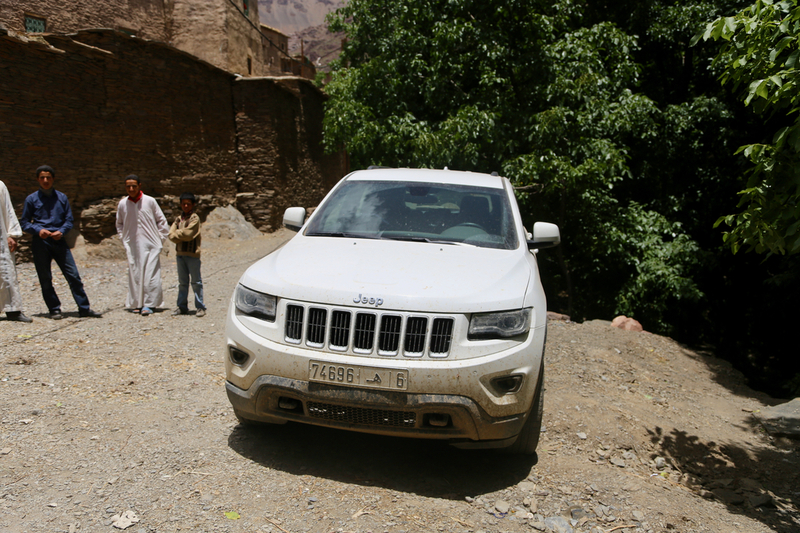 I carefully drove my rented Cherokee Jeep onwards, into the river bed and through the narrow street of the villages until arrival at the very last mountain village at a respectable 2300 meter of elevation. 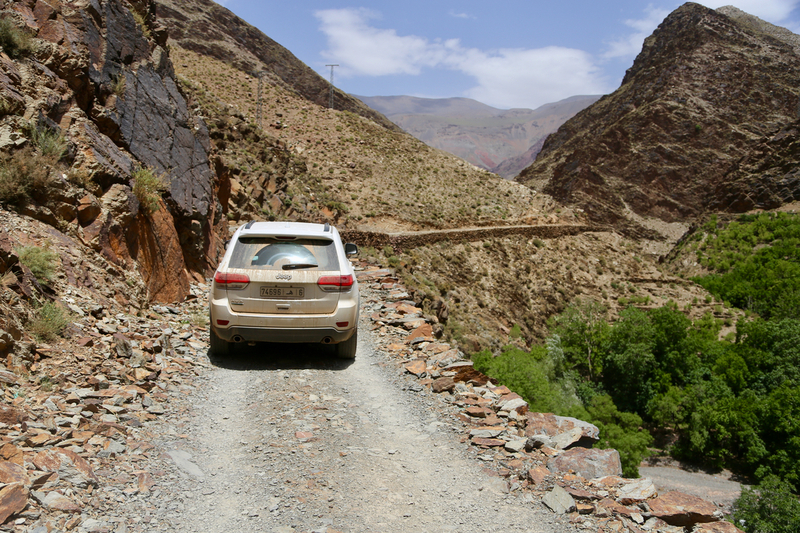 Along the way, I had driven through a very narrow spot, barely space for the river and the narrow mountain road. All in all a very worthwhile drive that can only be highly recommended. The people of this upper village (I do not know the village name), were very friendly. It seemed clear that a vehicle visiting was not a routine event. Parking was arranged and several people politely asked if they could offer me some meal before starting the hike. I got underway, leaving the last building, around 1245 with 3-4 kids following along. The route was pretty obvious, but the kids obviously knew the fine details, this was certainly convenient. We ascended the steepish part and it was time to say "Au Revoir" to the kids. I walked by the shepards hut, not in active use, then picked a quite reasonable route across to the valley that led towards the main crest. Rain started behind and below me, but the conditions looked fine. I had planned to camp before the summit, then complete the trip the next day, however there seemed to be no reason to stop here. 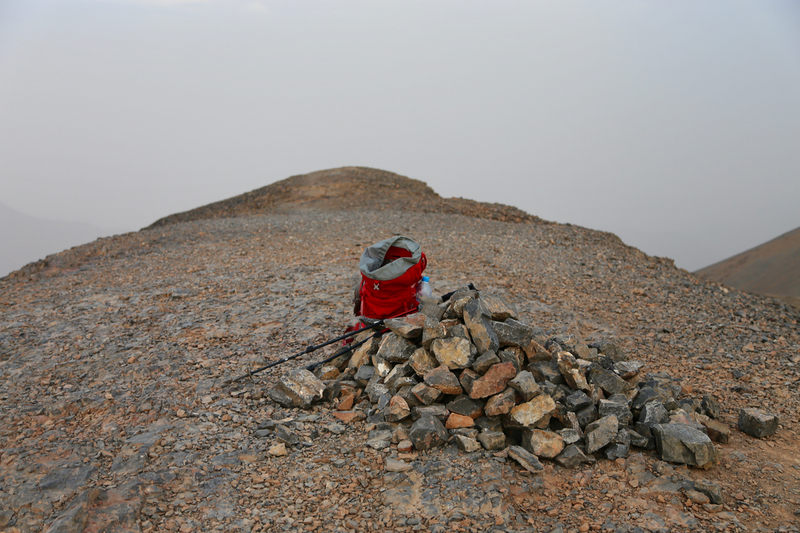 I completed the ascent to the main crest around 1815, then walked along the nice ridge arriving at the summit by 1900. It was cloudy, but no rain. I made up my mind to simply camp at the summit. I was certain that the clouds would go away and that a clear night would be followed by a nice sunrise. How often do you actually sleep on top of an ultra? There was a nice spot just a few meter from the cairn. Soon, I was resting in my bivu-bag after having put on extra clothing, a wool shirt, a fleece and wool underwear. The stars all appeared, just as predicted. Unfortunately, the temperature dropped a bit more than ideal. 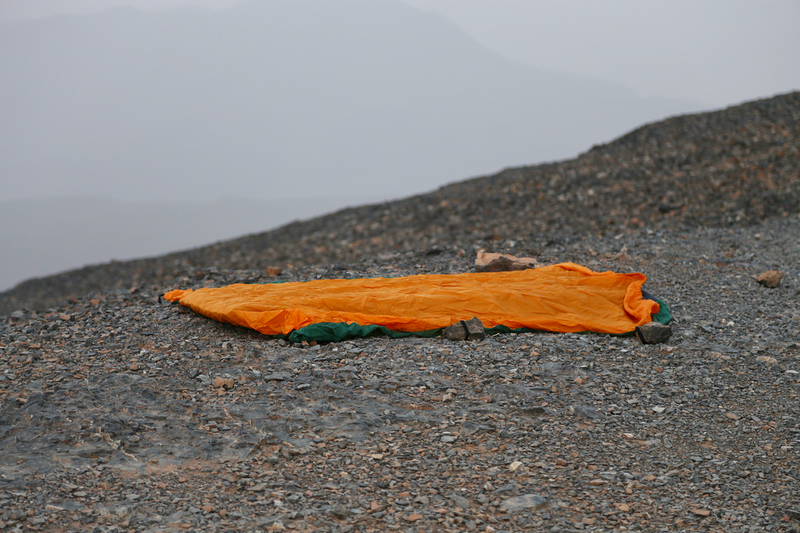 A sleeping bag had been perfect. As it was, too cold for comfort and thus little sleep. I was ok in the sense of not having a serious problem, I could always just have started my descent. Still, this turned out to be a pretty rough and very long night. The time moved slower than I had experienced recently. The nice sunrise and some good morning photo opportunity was my main motivation. 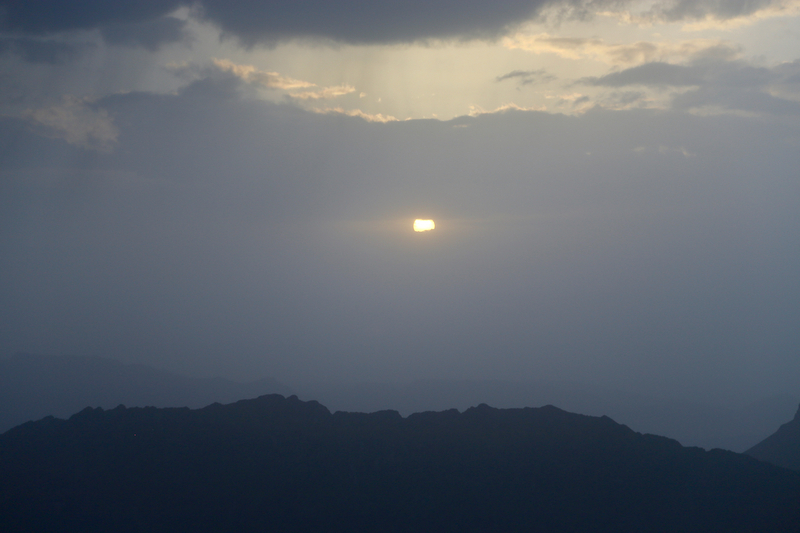 Finally, at 0500 when complete daylight were back, I realized that my sunrise would not take place. It was windy and clouds had assembled all around the east part of the horizon. No good pictures! 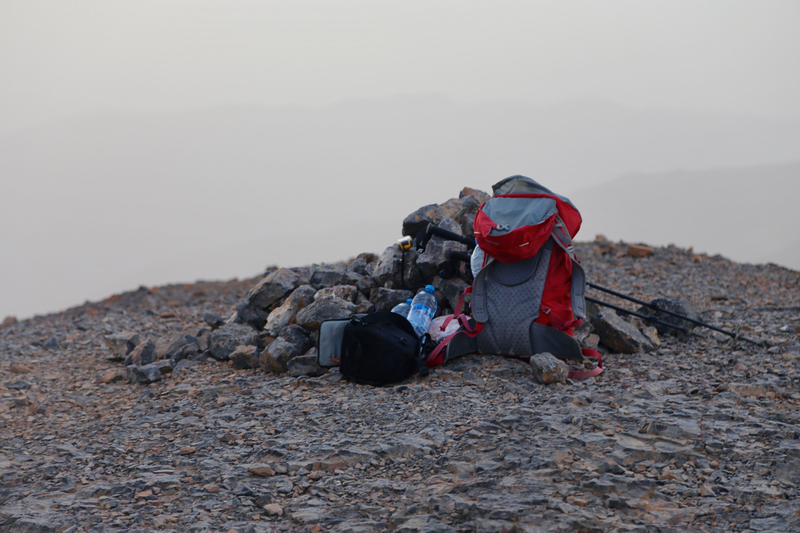 I felt an urge to regain more body temperature, broke camp and hustled along the ridge. After descending the first big slope to the south I made a first stop to reorganize. It was already warmer, despite the missing sun. 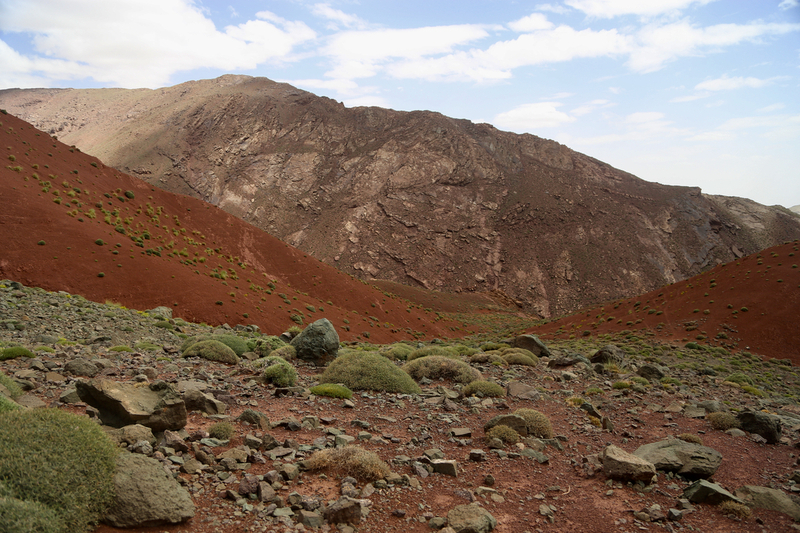 Time to put clothing in the backpack, to drink some water and get into a mood to enjoy the landscape and this part of the high Atlas on my return hike. I made several more short stops to look around and drink water, I carried more than would be needed. Still, arriving back in the upper village around 0930. There, I was again welcomed with friendly smiles as I changed to sandals and got ready to take the car back down the long and narrow road. The return drive went smoothly, I offered a lift to two different men walking along the mountain road, none of them gave any signal, but they were both quite pleased when I stopped and offered them a ride. The first one for about one kilometer, the second man perhaps about two. 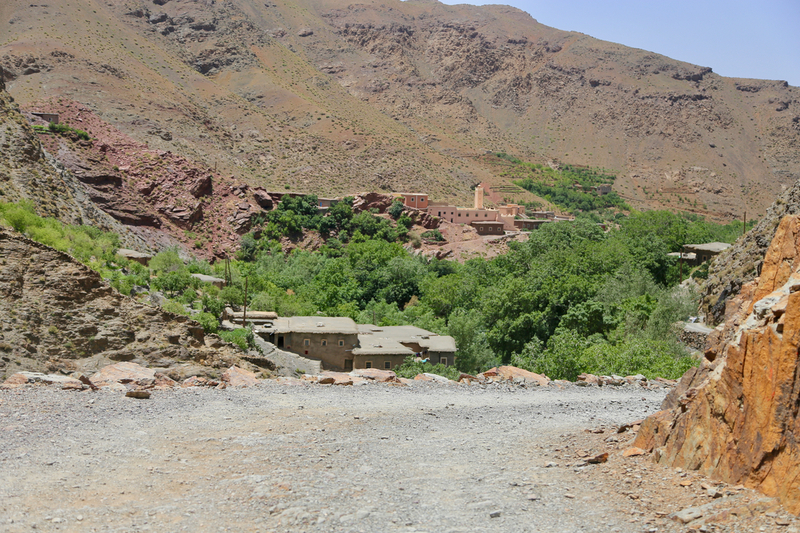 Finally, near Quarzazate, I picked up a hitch-hiker that were going all the way to Marrakech. A second year student of physics, he spoke reasonable English and provided good company on my drive back. There was more traffic on the road, people were travelling home after the traditional celebration at the end of Ramadan. 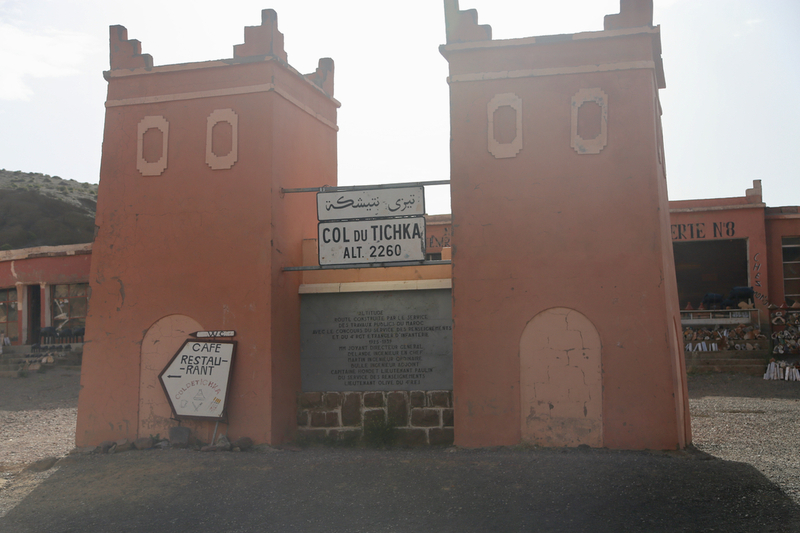 I arrived in Marrakech around 1530 after a long, but very successful trip. The last house in town. Looking back, the initial part of the ascent. Looking back, while ascending in the upper valley. The gorge, the last part of the route back down.